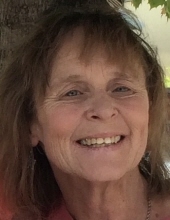 Karen Michelle Chilton-Pino passed away at home in her bed surrounded by family the morning of January 29, 2019. Born May 11, 1953, Karen grew up believing in fairy tales and and angels. She never outgrew this faith and she spread a little bit of magic everywhere she went. She was a rare soul who was truly full of the beauty of life and she shared her light and joy with all who knew her. Karen saw the best in everyone and taught her children what real love is and to treat others the way we all want to be treated. Working with children brought tremendous joy to Karen. She had an amazing ability to meet each child exactly where they were and help them grow into confident young adults. She cherished all the children she worked with and thought of them as her own. She treasured all animals, big and small, and treated all of them the same way she treated all the people in her life. Our world lost a one in a million soul and the heavens gained the brightest star the moment she let out her last breath. Karen was welcomed to the next part of her journey by her parents, George and Susan Boles, Husband, Grey Pino, grandchildren, William and Sara Johnston, great granddaughters, Arya and Carly Walton, and her most beloved companion and friend Onyx. She is survived by her brother Kevin Boles, children Celeste Chilton, Damon Chilton (Angelina), Wilea Johnston (William), Melinda Adams (Weston), Colby Steil, grandchildren Analisa, Aleigha, Ava, Kendra (Alex), Leslie (Michael), Bryce, Sierra, Kevin, and Luna, great granddaughter Eleanor, and so many more family and friends who will forever miss her sweet spirit and magic. The family would like to extend their heartfelt gratitude to this entire community for all you have done for Karen and all of her family. Let’s let the sunshine shine a little brighter each and every time she crosses our memory. A memorial celebration will be held on Saturday, February 2, 2019 at 3:00 PM at the Church of Jesus Christ of Latter-day Saints, Williams Ward, in Niter, Idaho. Please share memories, photographs and condolences on Karen's tribute wall. To send flowers or a remembrance gift to the family of Karen M. Pino, please visit our Tribute Store. "Email Address" would like to share the life celebration of Karen M. Pino. Click on the "link" to go to share a favorite memory or leave a condolence message for the family.